New Zealand because of its size is an easy country to travel around by car. A few hours drive will take you city to city on either island and there are many small towns and points of scenic or historic interest in between. Good quality accommodation is readily available and it's a good idea to get off the beaten track and meet the locals and check out New Zealand's unique beauty. There is no national network of multi lane motorways so travel is on standard 2 lane highways where the speed limit is 100 kph and is rigidly enforced by the authorities. With the exception of the high density population areas around Auckland and Wellington, traffic is generally light. If you're accustomed to driving in Europe or the USA where traffic drives on the right hand side of the road, you need to be particularly careful to stay on the left when driving in New Zealand. Visitors are often surprised to find that they can travel from the east coast to the west coast in a matter of only a few hours. Of course how much you see of the country will depend on how much time you have available and what your interests are. If you're just wanting to drive around and enjoy the scenery and have a relaxing holiday through either or both the North and South Islands - these are just some general tips. When driving in New Zealand, allow approximately 5 hours a day of driving. This allows you to have driving breaks on the way and allows time for sightseeing. The map on the left gives you approximate driving times between destinations. You can use one way rentals and travel the full length of the country or if you prefer, you can drive down one coast and back up the other and leave from the same airport you arrived at. There are regular ferry crossings from Wellington to Picton and vice versa. Travelling by ferry across Cook Straight gives you the opportunity to see the beautiful Marlborough Sounds and Picton. Interislander and Bluebridge ferries take about three hours to cross Cook Strait between Wellington in the North Island and Picton to South Island. If travelling by rental car, you can leave your car at the ferry terminal and collect another car at the other side. When you check in, your bags are taken care of and you're free to relax on the ferry and enjoy the views. If you are picking a rental car in Picton, you will need to have a reservation on an Interislander or Bluebridge ferry in advance, as most rental car operates in Picton will have vehicles available for prebooked hires only due to the isolated nature of Picton.. Please make sure that you a rental car more than 7 days if picking up in Greymouth or you will pay a Pick Up Fee of NZ$75 to NZ$150.00 (depending on rental car operator used) if hire is less than 7 days. This also applies if dropping off in Greymouth and if the hire is less than 7 days. 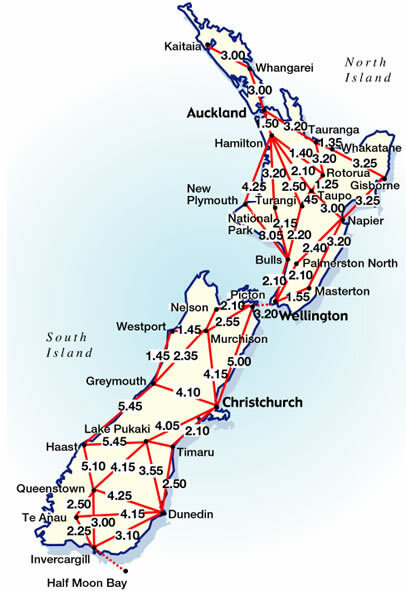 If you are dropping off in Christchurchand picking in Greymouth or dropping off in Greymouth and picking up in Christchurch, it is strongly recommended that you have a confirmed reservation on The TranzAlpine train, so you can advise your rental car operator of your reservation when you first pick up your rental car.